It occurred to me that my last blog post was kind of boring. No pictures, and it was very stream of consciousness with very little cohesive structure. Ah, sleep deprivation. It’s a thing. Let’s try again? 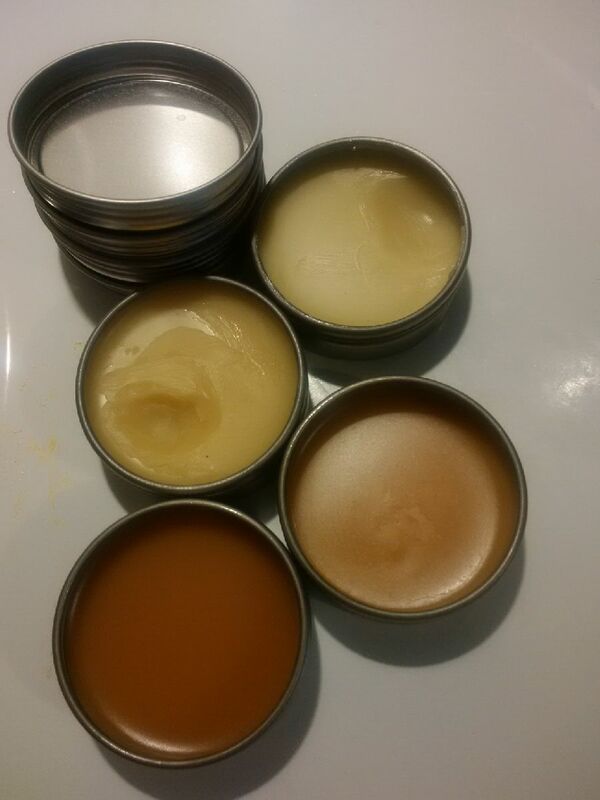 So I made some one ounce solid perfumes, and I was impressed with myself because I did it while carrying the baby in the baby carrier on my chest. She was happy. I was happy. I actually made three, one of these-the one with the most missing-is an experiment from another day. You can make several perfumes’ worth of base at once and leave the container in simmering water while you work on each. I put the essential oils in the small, 1 oz containers and proceeded to top off with the base, then stir with chopsticks until mixed well. It was relatively mess free that way, even with baby in her carrier reaching for everything. Melt these together in a double boiler. You can improvise a double boiler for the microwave with a glass measuring cup inside a small mixing bowl, but I still advise always using a double boiler when working with beeswax as it’s melting point is so high most plastics melt before it does. It’s also extremely hot when it’s in liquid form, so use oven mitts to handle your container and avoid getting this liquid mess on your bare skin! Defiitely don’t spill it on the baby! 1-3 drops vetiver essential oil- start with one, swirl it in, wait, and then add the others one at a time. This is powerful stuff and it will be stronger the next day. So if you like it, leave it alone, it will be awesome later. This smells so good. It’s really very gender neutral and has that good mix of woodsy and spicy, with some fresh citrus from the bergamot and a little mystery and smoke from the vetiver that you can control by dialing it up or down. I went for the full three drops because I love the way vetiver smells and I don’t mind a more “masculine” scent on myself. I could rub this all over, everyday, and may adapt this scent combo to a nice, light lotion soon! Because of the bergamot essential oil being in the citrus family, this perfume could make you photo sensitive. Either use the bergapetene-free version or be cautious if rubbing it all over you and playing in the sun. I admit I put this on pulse points and my neck and chest, so if I were out riding my bike in a tank I could be risking a sunburn. Personally, I’ve never had an essential oil cause a sunburn but I’m not prone to sunburns (I have darker skin and I tan easily)… But I’ve heard some stories though. So be cautious with the citrus oils. This perfume and the next one are labdanum based, and labdanum is more of a gooey resin than an essential oil. When I say “drops”, I hope you understand I was dipping a chopstick in the bottle and counting every blob that fell off as two drops because they were so big. That is how I did it…labdanum and benzoin have to be measured in blobs, not neat drops. Addendum: you can put the bottle in very, very hot (but not boiling!) water to get it to be less gooey and more liquid. Leave it in the hot water approximately 15 min. 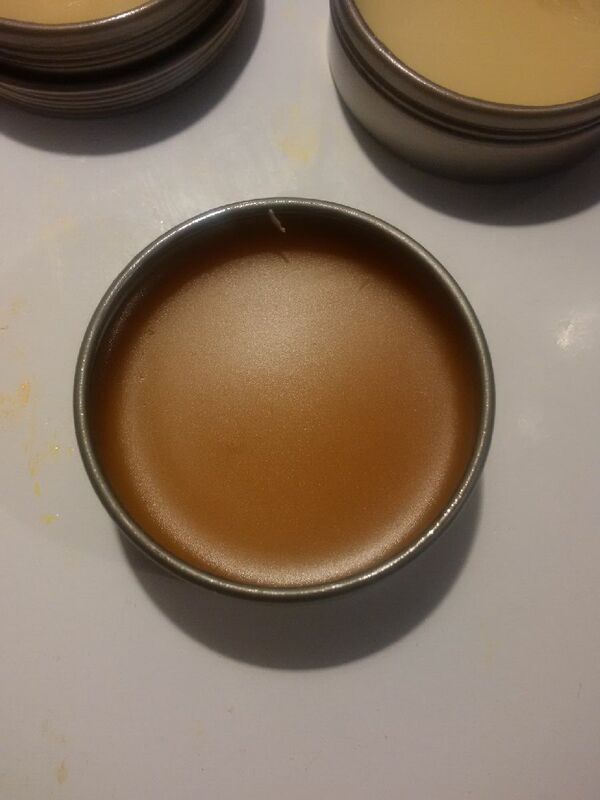 This perfume I made a few months ago when I first got a bottle of hydacheim essential oil. It’s dry and spicy, with a hint of citrus, but otherwise very much like patchouli. I love it. It brings out my hidden hippie side, lol. At first it’s overpowering but the scent soon mellows and becomes lovely. If you don’t have hydacheim, and don’t want to invest in it, try making this with dark patchouli. It should still be awesome but I haven’t tried it yet. When I made this perfume I was horrified and almost tossed the whole thing in the trash, but now I’m glad I didn’t as it has developed into a really nice little tub of (admittedly very hippie-esque) of perfume that is reminiscent of incense from my childhood. I can’t give you the recipe, because sadly I didn’t keep track of exactly what went into it. I can tell you what, just not how much exactly. The rest in tiny amounts, like 1-3%. If I remake this perfume I will leave out most of this stuff…see the notes! 3) Patchouli-to “compliment” the Hydacheim. Gone! They are too much alike! I may someday make this with 10% hydacheim and 10% patchouli, but that’s a fun variation to consider. 4) Cassia-to amp up sweet spice notes of Hydacheim. 5) Clove- to amp up spicy notes, I think I would keep cassia or clove, but probably not both. I will decide after I wear the perfume more and I decide which one comes through better and works with the mix. (Addendum: you really need both, or possibly clove and nutmeg would be awesome). 6) Black pepper, woodsy and peppery. Gone. It’s a more expensive essential oil and doesn’t really shine in this perfume. I can’t justify wasting it here. The cedar and juniper work, but not pepper. 7) Juniper, for more a sweet woodsy note. I love this alot. 8) Frankincense, for woodsy note. I will keep either juniper or frankincense, probably juniper. I can get hints of juniper now and then and it works with the hydacheim and lavender. I’m not smelling the frankincense and I think it may be just a little to close to hydacheim and patchouli to work. 9) Cedarwood, for smokey woodsy. Def keep, and possibly increase. It’s enough different from the hydacheim that it complements it well. Other options would be to try cade or vetiver, but I think they would be too smokey where the cedarwood is just right. 10) Litsea Cubeba for citrus top note. Defiitely keep a citrus note, although I may use red mandarin instead for all or part because lemony isn’t quite right, and litsea cubeba is pretty lemony. Petitgrain might work too, in full or at 50%. My favorite idea is a combo of grapefruit, lime, and sweet orange (I really like this idea, or the petitgrain instead of sweet orange) The citrus note needs to be worked out! Next version, I will have to figure this out. 4 drops cedarwood, and maybe increase to 6 drops! TIME! THIS TAKES TIME TO MATURE! As in, minimum one month. The longer you leave it, the better it smells. The problem was that the hydacheim overpowered everything initially. So nothing I put in, no matter what, came through. Even cedar, which usually is a great smell and strong, was lost. Cassia and clove were lost. That’s why I almost tossed the whole thing. The fact that it was about half Bulgarian Lavender essential oil wasn’t making a difference, it was like working with sodium hydroxide: all the scents changed and morphed on me. Of course, now that it’s mellowed and blended, it’s significantly nicer and I like it much more. 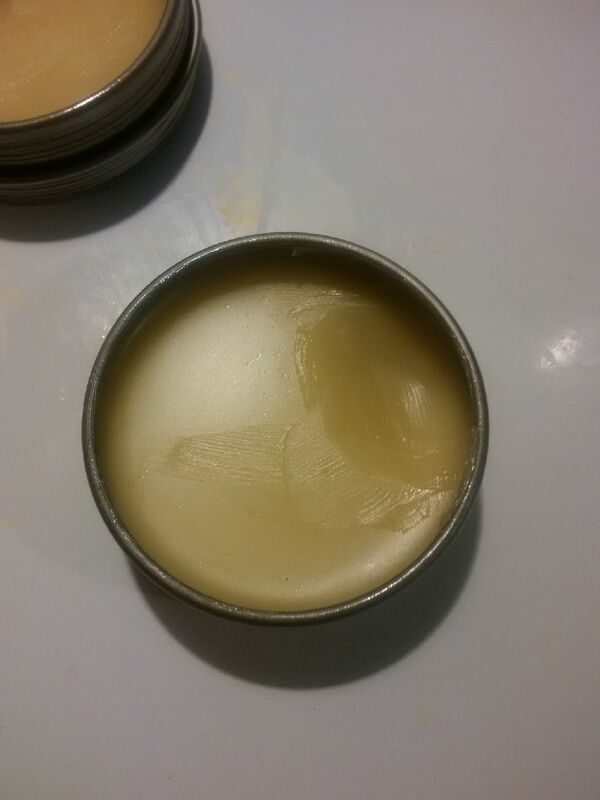 I will be making solid bug away balms here soon, and when I do I will take a minute and remake this perfume so it has a few months to mature again. (Addendum: it’s been six months and I’m finally making more perfumes, lol). There are some great DIY perfume ideas online, and I found a collection of them to stimulate my imagination by looking here. However, I ultimately went off of sources I trusted and what I already knew I liked, as well as some research into good essential oil blends. In the end, your nose and what works for your body chemistry once it’s on you will be the final judges. That’s part of why I make such small amounts. Theoretically, you can also mix these same oils into a 5 or 10 ml roller pen and top with either 91% alcohol, perfumer’s alcohol (hard to source), or a nice light oil like grapeseed that is easily absorbed by the skin. You could also make body spray in small, 2 oz spritzer bottles (or double your essential oils) for larger bottles, add red turkey oil or polysorbate 20 in the same volume (not weight, but volume) as the essential oils, and top with distilled water that’s been boiled for 20 min and then brought to room temperature. If you do make a body spray, add a broad spectrum preservative at the manufacturers intended rate. I like using Optiphen or Liquid Germall Plus at 1% in these sorts of things so that’s 0.5g preservative for a 2 oz bottle or 1g preservative for a 4 oz. Be sure to check the manufacturers recommend use for the preservative of your choice and make sure it’s appropriate for a suspension that’s largely water. Phenonip, for example, would be a poor choice here since its intended for items that are largely oil. Make sense? 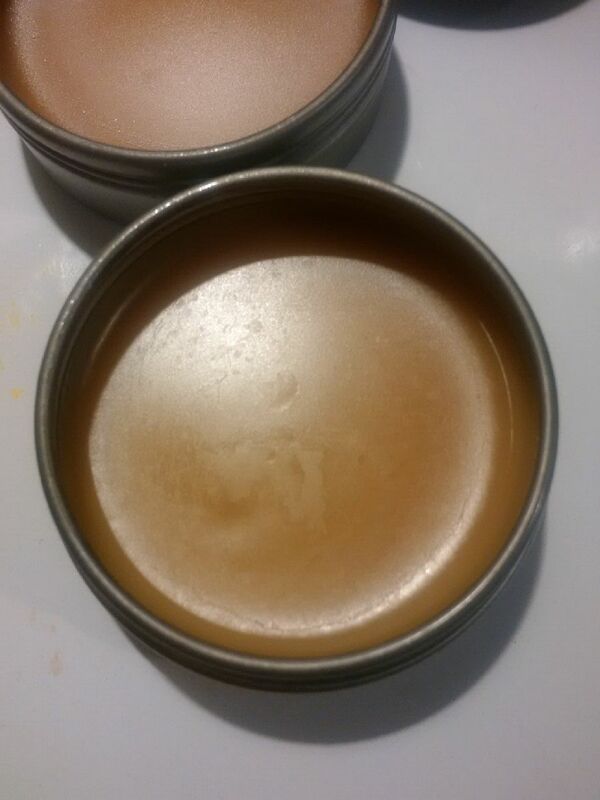 See my preservatives page (it’s linked to my “About” page) for more details. But please don’t make a body spray that’s water based with no preservative. You could make a body spray that’s 30-50% 91% rubbing alcohol instead, and that should allow you to eliminate the preservative. However, it would be drying on your skin so I don’t recommend it. Yoid also have to wait for the alcohol to evaporate before you could smell the perfume, which is sad. The amount of preservative is negligible but saves you from invisible microbes like bad bacteria and also prevents mold, which can take over your product in mere days. It’s totally worth it to invest in the preservatives you’ll need to make safe skin products. If nothing else, purchase Liquid Germall Plus for your everyday things and something like Phenonip if you’re making sugar scrubs. All that being said, you may wonder why these perfumes don’t have preservative. It’s because they are oil based and water free. If there was concern you’d be dipping wet fingers into them, I would recommend adding Phenonip, but since we apply our perfumes with clean, dry hands then we can skip the preservatives and focus on anti-oxidants like Vitamin E which should extend the shelf life of your perfume. However, should your perfume start to have an off smell, particular that of old crayons or canned nuts, it’s a good idea to toss it and start again. That’s a top sign it’s gone rancid (which shouldn’t be for at least a year, possibly longer). Clean up for beeswax based items is often difficult. I recommend warming the container up til you can use a small spatula to scrape any and all excess into the trash. Then rinse the container several times with scalding water (the hottest your faucet puts out) and that will melt off the remaining wax. 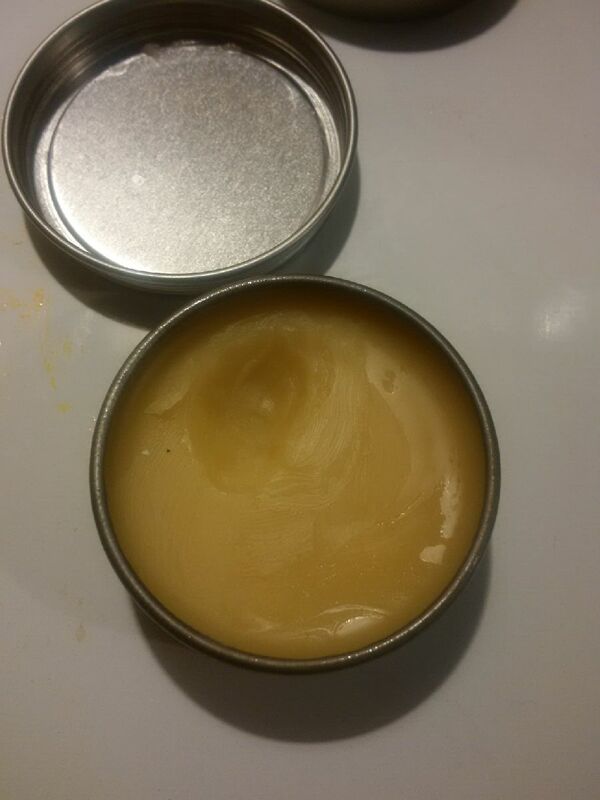 From there, I use nearly boiling water (pop a cup in the microwave to boil water) and my DIY scouring powder (1 bar homemade soap, which is 50/50 lard and coconut oil and only 1% superfat-if you want to make that someday, or you can substitute a bar of something like Ivory or Fels Naphtha), plus 3/4c each washing soda or baking soda and Borax…grate the soap then process it all in your food processor til it’s a nice powder. It works; the microcrystalline structure of the soda actually scrapes grease and oils, the soap works as a surfactant, and the Borax binds to certain things and you end up with everything sparkling clean. Just let that water cool before you scrub the container out; this scrubbing powder needs time to work. This scrubbing powder is so awesome to have on hand when making things like lip balms or other high wax items. It will also work on baked on goods with your everyday dishes, so make a double batch and store in a coffee can in your kitchen. It’s also good for cleaning bathrooms and especially bathtubs. You can add some oxyclean if you need a little kicker on stains or soap scum. If you simply can’t be bothered to make the DIY scouring powder, you can try a bleach based one like Ajax or Comet. I admit, I still use Ajax on my toilet bowl. Amy Warden on November Soap Challenge!